O Όμιλος ΙΜΕRYS είναι ο παγκόσμιος ηγέτης βιομηχανικών λύσεων βασισμένων στα ορυκτά, προσφέροντας εξειδικευμένες λύσεις, απαραίτητες για τους πελάτες του. Η IMERYS ΒΙΟΜΗΧΑΝΙΚΑ ΟΡΥΚΤΑ ΕΛΛΑΣ ΑΝΩΝΥΜΗ ΕΤΑΙΡΙΑ εξορύσσει και επεξεργάζεται βιομηχανικά ορυκτά, κυρίως μπεντονίτη και περλίτη. "Μακροπρόθεσμος o συνδυασμός των φιλοδοξιών μας για ανάπτυξη"
Στην IMERYS δημιουργούμε αξία για τους πελάτες μας και για την κοινωνία μέσω των προϊόντων και των λύσεων που παρέχουμε. Η βιώσιμη ανάπτυξη είναι η προσέγγισή μας σε έναν τρόπο επιχειρείν ο οποίος υποστηρίζει την επίτευξη των στόχων μας και ενσωματώνει τις ανάγκες και τις φιλοδοξίες των συμμετόχων μας. Λαμβάνουμε σοβαρά υπόψη μας τις επιδράσεις που ενδεχομένως μπορεί να έχουν τα προϊόντα και η λειτουργία μας σε πελάτες, εργαζόμενους, προμηθευτές, το φυσικό περιβάλλον και τις τοπικές κοινωνίες που δραστηριοποιούμαστε. Επικοινωνούμε και δρούμε ως υπεύθυνοι εταιρικοί πολίτες αλλά προετοιμαζόμαστε για τις προκλήσεις που αντιμετωπίζουμε σήμερα και θα αντιμετωπίσουμε στο μέλλον. Ο μακροπρόθεσμος συνδυασμός των φιλοδοξιών μας για ανάπτυξη με την κοινωνική και περιβαλλοντική μας ευθύνη, επικεντρώνει τη Στρατηγική μας για Βιώσιμη Ανάπτυξη σε τρείς τομείς: κοινωνία, περιβάλλον και εταιρική διακυβέρνηση. Imerys respects the world in which it operates. Imerys is committed to play a role in society, to meet its obligations to the countries and communities within which it does business, and to act as responsible environment stewards and thereby contribute to sustainable development. Imerys 2017 Corporate Social Responsibility (CSR) objectives originate from a 2015-2017 three-year Sustainable Development (SD) plan published in 2014. The three-year plan was developed taking into consideration a wide range of inputs from internal and external stakeholders. Yearly objectives aim to achieve gradual performance improvement articulated around three axes: (1) Social, (2) Environment and (3) Governance. In 2017, Imerys decided to develop a new CSR strategic plan launched in an iterative fashion starting from early 2018. The mid-term objective to be achieved through this new plan is to further embed CSR within the Group strategy and drive systematic continuous improvement of CSR aspects in operations, thereby continuing to reduce risks, unlock opportunities and build capacity for long term value creation. In September 2015, 193 member States of the United Nations adopted 17 Sustainable Development Goals (SDG) with the aim to end extreme poverty, protect the planet and ensure prosperity for all within a new universal agenda. Imerys supports the ambitions of this global program and is duly evaluating the policies and practices within its operations that directly contribute to these sustainable development objectives. (5) International Labour Organization (ILO) Fundamental Conventions. For additional information regarding Imerys strategy, please refer to 2017 CSR Report (pp. 2-3, 28). Imerys Industrial Minerals Greece S.A. (hereinafter named “Imerys Greece S.A.”) facilities are certified with ISO 9001:2015 Quality Management System (QMS), ISO 14001:2015 Environmental Management System (EMS) and BS OHSAS 18001:2007 Occupational Health and Safety Management System (OHSMS). Based on the risk-based approach imposed by ISO 9001:2015 and ISO 14001:2015 standards, Imerys Greece S.A. established a systematic and consistent methodology and integrated it with the BPI BU process approach. This risk management methodology helped also identify opportunities, except risks per process and facility. Application of the criteria and methods needed to ensure the effective operation and control of these processes, through key performance indicators (KPIs) set and monitoring. Main risks identified are related to Imerys business, regulation and legal risks, while main opportunities identified are related to new resources/ reserves, new financial markets and advanced human capital. Ensuring the safety and health of employees as well as contractors is Imerys’ number one priority. Being a safe place to work is a cornerstone of Imerys’ sustainability. The most important asset, thus ensuring the respect of human rights and labour practices, developing tools for talent and skills management, maintaining constructive social dialogue and ensuring a diverse and inclusive environment with equal opportunities. Imerys is committed to contribute to reduce the impacts of climate change and is aware of the global trend towards an economy that is low carbon or carbon-free. For the transformation of industrial minerals, this requires ensuring greater energy efficiency through new technologies and processes as well as integration of renewable energy sources. The techniques used for processing industrial minerals are primarily physical (crushing, milling, and sorting) but also include thermal processes. Imerys strives to optimize the use of mineral resources and processing of mineral solids, limit the consumption of utilities such as water, manage the discharges of industrial waste, gaseous and liquid effluents and preserve biodiversity. Noise and vibration, dust, and spill of hazardous substances are significant at local site level and as such are managed accordingly within each facility Environmental Management System (EMS). Strong corporate governance is focused on fair operating practices, and responsible supply chain require. Imerys also faces social challenges and opportunities in its interactions with the communities surrounding its sites. Imerys makes a fundamental contribution to a multitude of regional, national and international economies and as a local employer, it creates concrete socio-economic benefits to employees, to contractors and suppliers, thus, helping to fight poverty and contribute to sustainable development. Contributes to the development of sustainable business opportunities for Imerys. The technological expertise within Imerys enables the Group to be in an excellent position to continuously improve the process efficiency and production methods of its operations. Corporate governance axis establishes CSR ambition and ensures activities are carried out ethically, including business ethics and compliance categories. Most material issues, which would also be the 2018 CSR priority themes are occupational safety management, biodiversity and land reclamation, fair operating practices and responsible supply chain, product sustainability, occupational health management and climate change strategy. For additional information regarding Imerys material CSR risks, please refer to 2017 CSR Report (pp. 5-6, 28-31). For additional information regarding Imerys material CSR risks, please refer to 2017 CSR Report (pp. 4-5). Imerys Greece S.A., being part of Imerys Group, abides by Group’s objectives and key performance indicators for 2017. Please find the detailed description of the above-mentioned in 2017 CSR Report (pp. 6, 28-31). Imerys Greece S.A. consists the Business Unit of Bentonite and Perlite Intermediates (BPI BU), part of the Metallurgy Division. Specifically, the 2017 CSR objectives of BPI BU are depicted in the following table. Based on these objectives, individual measures are thereafter documented within the specific facilities and departments. MSV = Management Safety Visit. Managers’ conducts safety visits so as to reinforce safe practices and diagnose unsafe ones. SSV = Supervisor Safety Visit. Supervisors’ conducts safety visits so as to reinforce safe practices and diagnose unsafe ones. Imerys Greece S.A. follows specific processes for the selection and evaluation of providers and contractors. A relevant providers/ contractors register is being kept and updated frequently. 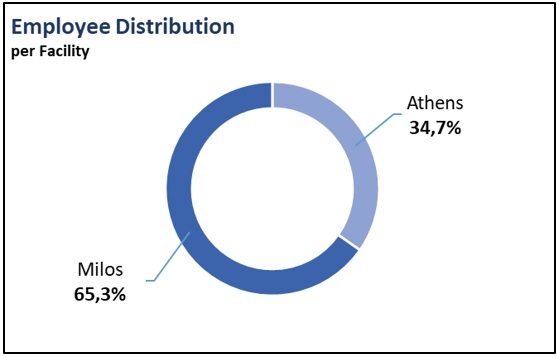 Based on that process, critical materials’ and services’ providers have been recognized for Greece’s facilities, which are energy and soda (for bentonite activation). Adherence to Imerys protocols and fundamental safety rules. All main (first tier) subcontractors have received Imerys ESG standards. Alignment of contractors within Imerys Safety System (ISS) and safety cultural expectations is fundamental to achieve the safety objective set each and every year. As such in 2017 a new Contractor Safety Management initiative was launched, which outlines a common and systematic approach for the selection, monitoring and continuous improvement of the health and safety performance of contractors and sub-contractors. In addition, Imerys Code of Business Conduct and Ethics (“the Code”) summarizes the principles of ethical behavior the Group expects from all of its contractors, suppliers, and other partners, let alone employees. For additional information, please refer also to criterion 17: Human Rights in the supply chain. Imerys Greece S.A. is the largest bentonite producer in Greece, with significant mining activities in other countries (U.S.A., Germany, Bulgaria, Hungary, Morocco and Georgia). It is, in fact, the largest bentonite producer in Europe and the largest bentonite company in the world. 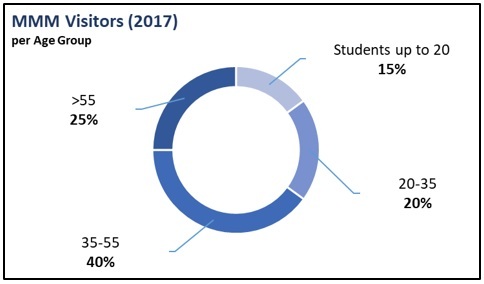 In 2017, the largest volume of bentonite production was mainly exported to the European market and to North America (Canada). Having a strong presence in international markets, bentonite is used in wide range of industrial applications and processes in the foundry and iron metallurgy market, in special applications (cat litter, papermaking), as well as in the construction industry, offering products and industrial solutions both in large infrastructure projects and in gas and oil drilling. During 2017, bentonite demand in foundry, which is interrelated with automotive market, had a slight upward trend. The same tendency appeared in other markets, such as iron, steel and civil engineering markets, while in oil and gas extraction markets there was a slightly downward trend. Imerys Greece S.A. is also the largest perlite producer in Greece, as well as the largest supplier of non-expanded perlite in the world. Perlite is widely used in building applications such as molded building materials (heat and sound insulation roof tiles and insulating filler materials) and provides industrial solutions to building materials, such as coatings, wall mortars and filtering media. Perlite is also used in cryogenic insulations, in agriculture, in foundries and as an improver additive in the production of phosphate fertilizers. In North America, for 2017, sales of perlite regarding building applications, agricultural uses and cat litter remained relatively stable compared to 2016. In Europe, construction industry sales as well as cryogenic applications declined compared to 2016, opposed to agricultural and specialty market sales, which showed a slight increase compared to 2016. Sets Imerys commitment to its role in society, to meeting its obligations to the countries and communities in which business is being done, as well as acting as responsible environmental steward. Establishes the overall framework and organization to accomplish compliance and continuous improvement in EHS at Imerys. Roles and responsibilities are being described for general managers, managers, EHS contacts, all employees and Group EHS employees. Describes the specific reporting system that has been put in place in the areas of environmental KPIs and environmental incidents. Specifies the standards for reporting energy, CO2 and production KPIs. Emphasizes that everyone in Imerys is responsible for health and safety and must actively contribute towards that direction. H&S programs created are driven by the principles stated in this document. Tracks certain metrics measuring the frequency of safety incidents among employees and contractors, and encourages continuous improvement of performance as measured by these metrics. It explains the input, validation and checking recommendations for KPIs. Most senior leadership (directors and managers) are actively involved not only into improving safety standards in company’s facilities, but also into improving safety culture via leading by example. Moreover, all Imerys Greece S.A. employees - from top management and senior executives to shop floor employees and technicians - are informed during their hiring process regarding (1) their work position occupational risk assessment, (2) Safety Cardinal Rules and protocols, (3) EHSQ Policy, (4) Imerys Code of Business Conduct and Ethics and (5) Anti-fraud and anti-bribery policy, thus being informed about ESG topics. 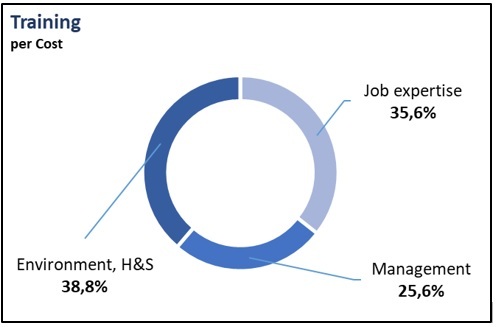 Top management and senior executives are actively engaged into implementing Group SD policies. Imerys Greece S.A. is a founding member of this organization. 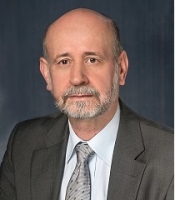 Mr. Athanasios Kefalas, General Manager Bentonite and Perlite Intermediates, is a board member. EHSQ and Supporting Services Manager, Mr. Yannis Karavelakis, is a member of the relevant working group. 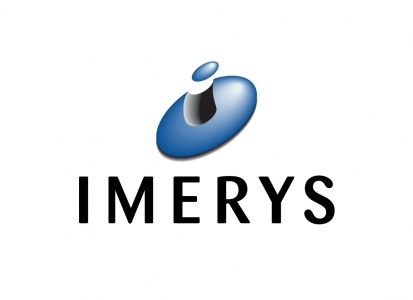 Imerys Greece S.A. is an enterprise – member of SME. Mr. Athanasios Kefalas, General Manager Bentonite and Perlite Intermediates is the president of Board of Directors, starting from 2017. Imerys’ internal governance framework is set down in the Code of Business Conduct and Ethics and the Corporate Governance policy, as well as in a number of charters (Sustainable Development Charter, Environment, Health & Safety Charter) that apply Group-wide. The Group’s charters, policies and manuals are grouped together in the Blue Book, which all employees can consult online via the intranet. Certain specific communications are subject to a process of electronic certification through which relevant employees certify that they have read the information and pledge to enforce the relevant internal controls in their area of responsibility. In operating activities, a second set of rules defines specific working and reporting principles as needed. In compliance with Group policies, these arrangements are adapted to the activities’ internal organization, the management of their specific mining, industrial and commercial activities and to their specific risks. They take into account specificities in terms of applicable local laws and regulations. Imerys Greece S.A. facilities are certified with ISO 9001:2015 Quality Management System (QMS), ISO 14001:2015 Environmental Management System (EMS) and BS OHSAS 18001:2007 Occupational Health and Safety Management System (OHSMS). Indicators connected with SD and CSR elements are also monitored in the context of the Integrated Management System (IMS). Imerys Greece S.A. follows a specific list of BU’s procedures and local (GR) instructions regarding quality, environment and health & safety issues, proving its compliance regarding the requirements of the 3 standards that is externally certified for. Based on the risk-based approach imposed by ISO 9001:2015 and ISO 14001:2015 standards, Imerys Greece S.A. established a systematic and consistent methodology and integrated it with the BPI BU process approach. This risk management methodology includes, between others, KPIs set per business process, in order to address risks and opportunities. The KPIs set are monitored via a relevant KPI registry form. Imerys Code of Business Conduct and Ethics (“the Code”) summarizes the principles of ethical behavior the Group expects from all of its employees, contractors, suppliers, and other partners. The umbrella principles set forth in the Code are supported by a series of policies and protocols applying to both the general conduct of Imerys and the individual conduct of each employee. The subjects covered by the Code include compliance with laws and regulations, protection of environment and human rights, relations with local communities and trade unions, workplace safety and health, diversity and equality, confidentiality, prevention of fraud or corruption, prevention of insider trading and conflicts of interest, protection of the Group’s assets, fair competition, transparency, and integrity. Imerys Greece S.A. facilities are included into an annual internal audit program. Internal audits are conducted according to its Integrated Management System (IMS), based on the status and importance of the processes and areas to be audited, as well as the results of previous audits. Audits are conducted by the use of generated checklists, procedures and interviews of personnel to determine compliance with quality, environmental, health & safety, customer, regulatory and other legal requirements. Internal audits are assigned to trained personnel (internal auditors), selected so as to ensure objectivity and impartibility of the audit process. Audit findings are communicated immediately, thus investigation, root causes found, corrective actions proposed and relevant action plan set should be in place. Audit findings are also reviewed at the management review meetings. Imerys Greece S.A. also utilizes outside consulting services to perform external audits in various auditing functions. As defined by EHS Auditing Procedure, it is the policy of Imerys to conduct periodic audits of the Group's operating facilities to determine how well they comply with EHS laws and regulations and Imerys’ EHS protocols. Imerys’ EHS audits are conducted every 3 years, covering everything from internal Imerys protocols to local laws and regulations, expert verification for mineral solid storage facilities, and mine safety. Failure to comply results in an audit finding. These findings are rated with Red; if the risk attached to the failure is serious or very systemic, Orange; if the risk is important or somewhat systemic and Yellow; if the risk is less significant and isolated. Together with the plant management, an action plan for correcting any audit findings is established within 45 days. Completion of corrective actions is tracked in a dedicated database called MK Insight. Outstanding findings are regularly presented to the Executive Committee. For Imerys SD policies and procedures please refer to Criterion 5. For additional information regarding Imerys rules and procedures, please refer to 2017 CSR Report (pp. 25-26) and to 2017 Registration Document (p. 119). Imerys’ key performance indicators (KPIs) on Corporate Social Responsibility have been defined and gradually evolved in accordance with pertinent international standards and regulatory framework, such as GRI’s Sustainability Reporting Guidelines (“Core” option), the UN GC, the UN Guiding Principles on Business and Human Rights, OECD Guidelines and the ILO Fundamental Conventions. Imerys uses an intranet reporting tool entitled “Symphony”, through which safety data, environmental KPIs, environmental incidents, energy, CO2 and production data are being reported every month and reviewed quarterly. Injury and health reporting protocol sets out the rules for inputting Safety data in Symphony and designates the individuals responsible for enforcing them. It explains the input, validation and checking recommendations for the KPIs in the reporting tool. Environmental reporting protocol and Energy, emissions & production reporting protocol address the reporting of corresponding information. Imerys Greece S.A. facilities are certified with ISO 9001:2015 Quality Management System (QMS), ISO 14001:2015 Environmental Management System (EMS) and BS OHSAS 18001:2007 Occupational Health and Safety Management System (OHSMS). Indicators connected with SD and CSR elements are also monitored in the context of the Integrated Management System (IMS). A complete summary of the Group’s non-financial Key Performance Indicators (KPIs), which also reflect local performance at site level, can be found in 2017 CSR Report (pp. 28-31). The CSR strategy and reporting approach is based on GRI’s Sustainability Reporting Guidelines (“Core” option). Imerys compensation and benefits systems and policies aim at ensuring both market competitiveness and internal consistency, while being driven by a clear pay-for-performance objective. Fixed compensations are reviewed on a yearly basis under the close coordination of the Human Resources function, supported by regular local and/or sectorial surveys, and conducted with strict financial discipline. Short term variable pay schemes include both individual and collective objectives, in order to reward both personal and financial collective performance. All top management and senior executives should include not only financial, but also health and safety objectives in their annual objectives. Achievement of the objectives is measured and observed annually by the upper tier employee. All Imerys employees are encouraged to include in their personal objectives issues dealing with sustainable development, such as health & safety, environment, human resources development etc. The weigh factor of each objective depends on the area of expertise of every employee. Long term compensation programs, based on Performance Shares, are fully aligned on the Group long term financial objectives. Imerys endeavours to align its remuneration practices across the best international standards. Job descriptions issued by Imerys Greece S.A. human resources departments for executives’ job positions are descriptive of the relevant EHS responsibilities that newly hired and older executives should follow. Moreover, all employees in Imerys Greece S.A. facilities are encouraged to participate voluntarily in corporate CSR actions, internal and external health and safety trainings, environmental initiatives and initiatives of the organizations that company is an active member (environmental and sustainability, industry and CSR organizations). For more information on the Group Executive Remuneration, see chapter 3, section 3.2 and 3.3 of the 2017 Registration Document. Imerys depends on the solid long-term relationships it develops with its key stakeholders; respecting the countries, communities and environments across the globe where its operations are located. As such Imerys considers itself accountable to a wide variety of stakeholders, both internal and external. Identifying stakeholders and gaining an understanding of their needs and expectations is a critical step to foster engagement. In the context of the definition of new CSR strategy, Imerys launched in 2017 a materiality assessment process in order to further integrate stakeholder expectations on environmental social and governance (ESG) risks, threats and opportunities facing the Group within the definition of material CSR priorities. This process can be summarized in three phases (1) framing: research and analysis required to identify and verify a long list of potentially significant ESG issues, (2) engagement: engagement of internal and external stakeholders by conducting surveys and (3) analysis and validation: resulting in defining the priority CSR themes to be addressed and preliminary actions to be taken. For additional information regarding Group’s stakeholder engagement, please refer to 2017 CSR Report (p. 4). Based on the risk-based approach imposed by ISO 9001:2015 and ISO 14001:2015 standards, Imerys Greece S.A. established a systematic and consistent methodology and integrated it with the BPI BU process approach. This risk management methodology helped, between others, the identification of interested parties/ stakeholders and the identification of their needs and expectations. These interested parties were also correlated with Imerys Greece S.A. business processes. Imerys is committed to providing high-quality products to its customers, and indirectly, to end-users. Each business is responsible for insuring that its products comply with regulatory requirements and to prevent potential physical and health hazards. For products manufactured in (or imported into) Europe, the Group complies with the European Directive on “Regulation, Evaluation and Authorization of Chemicals” (REACH). Substances marketed by Imerys are frequently subject to risk studies to determine their properties. For example, substances have undergone risk studies pursuant to the implementation of the GHS/CLP (Globally Harmonized System/Classification, Labeling and Packaging of chemicals) Regulations in Europe. Imerys monitors these studies closely, and labels its products to appropriately reflect the results of these studies. For certain minerals, the Group applies the Mine to Market Mineral Management (M4) program, which is articulated around four components (1) ore/deposit characterization at all stages of the mineral cycle, (2) product quality monitoring, (3) industrial hygiene and, (4) management review. The characterization of the ore starts from the mine planning stage and follows the ore through all mining stages prior to the milling of the product. The quality of the product is verified using a combination of the state-of-the-art techniques, and ore is rejected if strict quality control standards cannot be confirmed. In 2017 the Group integrated product stewardship as one of the new disciplines with the Corporate CSR Department and further strengthened this expertise through the creation of an external scientific advisory panel. To remain competitive, maintain organic growth and increase profitability, the Group puts organizational, technological and commercial innovation at the heart of its strategy. Through addition, the Group likewise ensures the sustainable development of its activities. Imerys has in place and follows an innovation policy, having set the key performance indicator (KPI) that 12% of its annual revenue should occur from new innovative products. The Science & Technology (S&T) teams who work alongside the divisions to envision and design innovative projects that align as closely as possible with the needs of customers and markets. Innovation in sales, marketing and new business development, which is the particular focus and responsibility of the Business Innovation teams. They conduct market surveys and analyze customer requirements and megatrends to identify fundamental shifts in the market and define the associated research projects. In its long-term development strategy, the Group is also supported by technology centers that provides process and technology development services for all its divisions. This approach allows Imerys to envision all types of new natural and synthetic mineral-based solutions, which helps its industrial customers to broaden the scope of possibilities for their own products. This commitment to disruptive innovation favours the emergence of new materials, new applications and new markets. In 2017, Imerys developed and perfected synthetic perlite called 3i LFM. As a flexible and easily cut foam, it is used to manufacture thermal insulation panels for buildings. The composition of these new‑generation panels makes them more eco-friendly, and they emit no harmful fumes in the event of fire. In 2017, Imerys gave a new and dynamic level of impetus to innovation, with a new organizational structure, a new name and new investment: all these changes mark an important and evolutionary step forward driven by the introduction of the Innovation department. The central challenge for innovation is to bring forward mineral-based solutions that dovetail with the needs of the market and the technology developments that will shape tomorrow’s world. Imerys Technology Centre (ITC) of Greece facilitate internal synergies and contribute to sharing best practices and assist in the development of shared and cross-disciplinary projects involving the Group’s scientific experts. Imerys commitment to developing tomorrow’s innovations also involves forming close long-term partnerships with renowned universities, research institutes and international organizations, thus ITC Greece have signed partnership agreement with the National Technical University of Athens (NTUA) for innovative projects. As of the end of 2017, Imerys Greece S.A. facilities were certified to the ISO 9001:2015 Quality Management System regarding its products and services. The New Standard Transition (NST) was finalized within that year. Imerys 2017 objectives is to improve by 6% the Group energy efficiency on the 2014 baseline by the end of 2017 and also improve by 6% the Group carbon efficiency on the 2014 baseline by the end of 2017. Imerys Greece S.A. retained the same Group target, assigning specific programs per facility (please refer to criterion 3 for full list of 2017 BPI BU CSR Objectives). In Milos, FLU-ACE condensing flue gas economizer project in Tsigrado plant was launched mid-2015 and after almost two years of research and development (R&D) studies and preparations, it was first implemented on May 2017. The system was an exclusively in-house project development and is considered an Imerys proprietary process. In 2017, 4 people have been occupied with the projects implementation and 400 hours have been spent, while the cost is estimated to approximately 208,000€. Net present value from the system’s operation is 124,000€ (depending on current oil prices). Target audience of this project is the local community and environment of Milos island. An average of 310 kW of heat is recovered from the exhaust gases of the Tsigrado dryer. Around 0.8 M3/hour water for industrial purposes is produced by cooling the flue gas from approximately 70-80°C down to 40° The total production of water for 4,500 hours of operation is 3,600 M3. As the system seems to be working very well, and with the expected positive outcome for Milos island environment, two more FLU-ACE condensing flue gas economizers are planning to be installed in Milos facilities (Voudia perlite plant), during 2018 - 2019. In order to educate young people regarding resources efficiency, an educational program is planned to organized in 2018 aiming at introducing the primary and secondary schools of Milos in the idea of recovering heat from a dryer and recovering water from the moisture contained in various materials. Imerys Greece S.A. is ISO 14001:2015 certified. Based on that, the company controls environmental non-compliances and corrective actions resulting from assessment of environmental impact and measurements of emissions. This happens by initiating emergency response plan or contingency plans to mitigate these non-compliances. Imerys facilities analyze the evolution of energy consumption and identifying the priorities for improvement, improve energy management and drive excellence through the “I-Cube” Program. The Group continues to support the transition to renewable energy and advanced and cleaner fossil-fuel technology, where feasible. Imerys priorities are (1) establishing and maintaining effective management of mineral resources, (2) reducing waste generation through prevention, reduction, recycling and reuse, and (3) minimize the impact of its operations on water resources. Mineral resources management is defined through a series of geology and mine planning policies, procedures and protocols. Each mining operation is required to have a Life of Mine Plan (LOM Plan) and create a detailed Five-Year Mine Plan. This approach enables the operations to maximize the efficient use of mineral resources, thereby contributing towards the targets of the SDG 12 to ensure sustainable consumption and production patterns. Imerys processes minerals using methods that are primarily mechanical and physical. As such the Group’s activities generate relatively small quantities of both domestic and industrial wastes. The Group is nevertheless committed to contribute further to SDG 12 on sustainable consumption and production patterns. Overburden and unused mineral solids (e.g., tailings, off-specification materials, etc.) are usually stored on or near production areas at the quarries given their potential to be used in the future. Overburden and unused minerals are also used in many cases as backfilling or re-profiling materials in post-mining restoration work. Imerys is committed to ensure effective management of water resources by focusing on three axes (1) optimizing water consumption by limiting withdrawal from natural environment, (2) developing recycling possibilities for process water, and (3) improving the water quality of liquid effluent emissions. The aforementioned commits contribute towards the targets of the SDG 6 to ensure availability and sustainable management of water and sanitation for all. Imerys classifies water withdrawals according to source, including groundwater, surface water and water suppliers. Water moved from one zone to another without being used (water pumped for quarrying operations) is not quantified within this metric as the quality of this water is not altered. Imerys also reports the amount of water recycled by its operations as recycling water reduces the amount of water being removed from natural habitats, thereby reducing the Group water footprint. Wastewater discharge is managed and reviewed in the site-specific EMS in compliance with the corresponding regulatory limits. Imerys preserves and creates biodiversity value by enhancing rehabilitation of mines during their life spans with the aim of harmonizing with local ecosystems. Imerys’ extractive activities have the potential to modify the environments where they are located. Quarries have their own characteristics, in part because of their landscape and ecological impacts, but also due to their long yet temporary operational and rehabilitation phases. The Group is committed to strengthen is expertise and in the quality of its practices to continue to contribute to SDG 15 to protect, restore and promote sustainable use of terrestrial ecosystems, sustainably manage forests, combat desertification, and halt and reverse land degradation and halt biodiversity loss. Rehabilitation is integrated into the Life of Mine (LOM) plan and considered throughout project execution during mining operations until mine closure. All Imerys Greece S.A. facilities are certified with ISO 14001:2015 Environmental Management System. Based on the Life Cycle Perspective (LCP) imposed by ISO 14001:2015 standard, Imerys Greece S.A. has mapped the life cycle stages that can be controlled or influenced by its facilities. Life cycle stages applicable vary depending on the activity, product or service, while LCP does not require a detailed life cycle assessment. Through this, the way company's products and services are designed, manufactured, distributed, consumed and disposed is controlled or influenced, by using a perspective that can prevent environmental impacts from being unintentionally shifted elsewhere within the life cycle. In 2017 Imerys Greece S.A. mined 1,065,899 MT of bentonite, 664,466 MT from Aggeria mine, 359,450 from Agia Irini mine and 41,983 MT from Zoulias mine. It also mined 365,124 MT of perlite, 243,862 MT from Tsigrado mine and 121,262 from Trachilas mine. Also 28,862 MT of sodium carbonate (Na2CO3) were used in 2017 for bentonite activation. Total waste quantity per facility and per European waste code (type of waste) is depicted in the following table. All waste are managed outside Imerys Greece S.A. facilities by certified waste companies. Waste disposal inside Milos facilities refers only to preliminary storage. Production of waste is reported per quarter. Herein total waste quantities are depicted for the year 2017. Imerys is committed to assess relevant environmental risks and continually improve control measures to reduce adverse environmental impacts. Imerys aims to minimize negative environmental impacts associated with its operations. Environmental stewardship rests upon the implementation of a robust Environmental Management Systems (EMS), a framework that is fundamental to contribute to numerous SDGs, but in particular to SDG 12 to ensure sustainable consumption and production patterns in the long term. Imerys requires each operation to have an effective EMS enabling it to identify and establish controls for significant environmental risks. The mandatory EMS requirements for all activities are covered by a Group-specific environmental protocol, which includes eight pillars aligned to the core elements of the international standards for environmental management systems: policy, aspects and impacts, legislative and regulatory requirements, objectives and targets, roles and responsibilities, training, emergency response, and auditing. In addition to implementation of mandatory EMS requirements, the Group encourages ISO 14001 certification, thus Imerys Greece S.A. transited to new standard ISO 14001:2015. Environmental regulatory compliance issues are regularly assessed and managed as part of the EMS. Please refer to Criterion 11 for additional information regarding resource management, such as materials used by weight or volume (GRI Disclosure 301-1), energy consumption within the organization (GRI Disclosure 302-1) and waste by type and disposal method (GRI Disclosure 306-2). The total volume of water withdrawn of Milos facilities is given with a breakdown in municipal water supplies, ground water and surface water. The amount of water recycled is also being reported, as recycling water reduces the amount of water being removed from natural habitats, thereby reducing Imerys water footprint. The consumption of water is reported quarterly. It has to be noted that surface water category refers to sea water used in scrubbers. Conscious of the importance of responsible water consumption in water scare areas, in 2017, Tsigrado facility in Milos island combined a carbon emission objective with a water consumption objective. The facility installed a new FLU-ACE condensing flue gas economizer system designed to recover waste heat from the dryer exhaust. The recovered energy is then used to preheat air within the same dryer in order to reduce fuel oil consumption and recover water for industrial purposes, thereby reducing emission and water consumption associated with the plant processes. For additional information regarding FLU-ACE condensing flue gas economizer project please refer to Criterion 10 and its relevant GRI Disclosure 302-4. Imerys applies advanced technologies and promote operational excellence to maximize the sustainable use of raw materials and other natural resources. Imerys recognizes that climate change is a major global challenge. Through the Groups’ commitment to the UN GC Principles and SDGs, the Group is determined to make progress towards helping overcome this challenge in part through efficient energy and emissions management. Imerys has operational energy demand, especially in its mineral transformation processes that use thermal technologies and its quarrying activities that use heavy equipment. Imerys participates in the climate change program of the Carbon Disclosure Project (CDP). As of the end of 2017 the Group CDP performance score was ranked as Level B, which corresponds to the “integration of climate change recognized as priority for strategy, not all initiatives fully established”. Imerys is improving energy management and driving excellence through the “I-Cube” or Imerys Industrial Improvement program, initially introduced in 2014. Energy efficiency improvement makes it possible to use less energy to achieve the same level of productivity and consequently to contribute to SDG 7 to ensure access to affordable, reliable, sustainable and modern energy for all. The majority of the Green House Gas (GHG) emissions are generated through in the production of thermal energy from natural gas, fossil fuel, biomass and steam. Indirect emissions from the consumption of electricity are the second source emissions. Measures to monitor and reduce the GHG emissions are one of the principal means through which Imerys contributes towards SDG 13 to take urgent action to combat climate change and its impacts. Interventions were made in the dedusting system of Voudia bentonite plant. These interventions had a positive impact on electricity consumption and dust emissions and resulted in the reduction of about 700,000 kWh/ year – 4% of the annual electricity consumption. Installation of a new condensing flue gas economizer system in Tsigrado plant, designed to recover waste heat from the dryer exhaust. The recovered energy is then used to preheat air within the same dryer in order to reduce fuel oil consumption and recover water for industrial purposes, thereby reducing emission and water consumption associated with the plant processes. This resulted in the reduction of about 140 MT of heavy fuel consumption – 1.2% of annual heavy oil consumption. Scope 1 emissions are direct emissions from sources owned or controlled by Imerys. Imerys Greece S.A. facilities in Milos do not produce direct (Scope 1) GHG emissions. This derives from the fact that the facility in Greece with existing gas emissions limits is an electricity generator located in Voudia, Milos. However, this generator operates only when a multi-hour power outage from PPC S.A. (Public Power Corporation S.A. – Hellas) exists. In 2017 the electric generator was not set in operation. Moreover, all facilities have their own approved environmental terms which abide by Greek Legislation concerning dust and smoke emitted by chimneys (Presidential Decree 1180/1981). Dust or solids in suspension, which affect the wider environment around plants through operations like transportation of bulk products and storage, do not exceed 150 mg/m3 in old plants and 100 mg/m3 in new plants or any specific limit given in approved environmental terms. Smoke does not exceed level 1 of Ringelmann scale, which is a scale for measuring the apparent density of smoke by observing the plume generated at the point of greatest opacity. Scope 2 emissions are indirect emissions from the generation of purchased energy. Every year around 1,000,000 MT of bentonite are mined on Milos Island and almost all of that quantity has to be dried to about 15% on average. Significant energy saving is achieved by exploiting Milos island climatic conditions - that are high temperature and wind during summer - for the natural pre-drying of bentonite in open fields. This results in approximately 35% annual energy savings, compared to the energy that would be required if industrial drying was exclusively used. It is estimated that some 100,000 MT of water are evaporated on a yearly basis through this field drying process. This is equivalent to actual savings of about 7,500 MT of annual heavy fuel oil consumption, corresponding to CO2 emissions reduction in the range of 24,000 MT per annum. Imerys Greece S.A. does not produce direct NOx and SO2 emissions. This derives from the fact that the facility in Greece with existing NOx and SO2 gas emissions limits is an electricity generator located in Voudia, Milos, which uses crude oil with low sulfur content. However, this generator operates only when a multi-hour power outage from PPC S.A. (Public Power Corporation S.A. – Hellas) exists. In 2017 the electric generator was not set in operation. The Group is committed to respect and promote the International Bill of Human Rights and provisions of the fundamental conventions of the ILO and to complying with local legislation in force in the countries where it operates, particularly in terms of nondiscrimination, privacy, child labour, compensation and working hours. To improve its procedures, the Group regularly updates its HR policies. Through constant engagement on these subjects the Group contributes to various SDG goals. Imerys strives to promote mutual respect and diversity in all practices and dealings with employees, contractors, suppliers, customers and vendors, and in the communities in which the Group operates. Imerys recognises that management of relations with employees is critical to the creation of an environment in which all employees can excel. Imerys endeavours to have a positive impact through its employment practices upon the welfare of employees and on the communities surrounding operations and thereby contribute to SDG 8 to promote sustained, inclusive and sustainable economic growth, full and productive employment and decent work for all. Imerys recognizes the right to freedom of association and the right to collective bargaining, which is clearly articulated within Imerys Code of Business Conduct and Ethics and the Employee Engagement Policy. The coverage of employees by Collective Bargaining Agreements (CBAs) include subjects such as health and safety, work organization and working hours, training, compensation and benefits, and equal opportunities. Imerys is fully committed to taking effective measures to end discrimination and to eradicate child labour and forced labour. Compliance with Imerys protocols on human rights and labour practices, including preventing child labour and forced labour, is included within due diligence assessment for new projects and within the scope of internal auditing missions for the Group existing activities. Protocols on prohibition of child labour and forced labour have been in place since 2009, and were reviewed and updated in 2017. Imerys Diversity Charter outlines the commitment to achieving greater diversity, as well as to equal opportunities and inclusion across the Group is a high priority and shall continue to be the focus of particular efforts at all levels of the organization. Imerys does not tolerate any discrimination and/or harassment of its employees, customers and vendors, on the basis of gender, age, nationality, citizenship, ethnicity, religion, background, sexual orientation, disabilities, marital and parental status, or political affiliation. Imerys recognizes that diversity is a long-term engagement and while the Group has not yet reached the full target it is fully committed to accelerate efforts and as such contribute further to SDG 5 to achieve gender equality and empower all women and girls and SDG 10 to reduce inequality within and among countries. In April of 2017, Imerys launched its first global employee engagement survey “Your Voice”. The questionnaire composed of 53 questions including open ended questions, was available in 17 languages (one of which was the Greek language for Imerys Greece S.A. employees) and was shared with all employees with corporate emails across all Imerys countries and divisions. “Your Voice” engagement survey, was a global survey to better understand how employees obtain information about Imerys and their respective area of the business, and how they perceive Imerys’ internal communications. An external consultancy firm and research institute specialized in communications was hired to conduct the survey, in order to guarantee, between others, the anonymity and confidentiality of employees’ responses. Imerys did not have direct access to individual answers. The first edition of Imerys' internal opinion survey "Your Voice" offered employees the chance to express themselves on important topics associated with work and company. The survey was conducted from 10 – 24.04.2017 and its results were communicated locally. A panel of around 3,000 employees throughout the Group was randomly selected to respond to an additional part of this survey, which was open for 2 weeks (13 – 24.11.2017). Among them were also Imerys Greece S.A. employees. The results allowed communication priorities establishment and identification of the areas requiring improvement in the communication strategy (improvement actions). 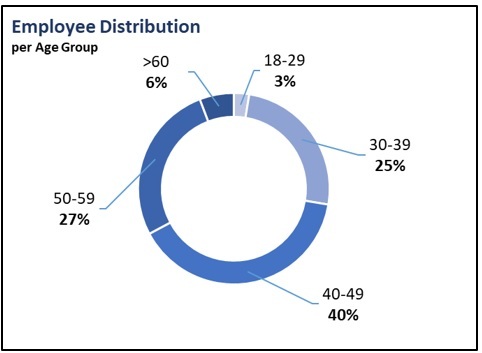 The additional survey’s results were also shared with employees. Safety Connect Day initiated in 2017 and is a full working day dedicated to safety and took place on 22.06.2017. The theme for 2017 was “Mobile Equipment and Pedestrian Safety”, one that was relevant to everyone throughout Imerys Group, irrespective of location. During the event, which became an annual occurrence in Imerys’ safety calendar for the years to come, employees in Milos and Athens facilities participated in a diverse range of interactive activities, trainings, seminars, working groups and sessions regarding safe driving. Training conducted on road safety issues was both theoretical and experiential. Overall, annual Safety Connect Day provides an occasion for employees to consider how their individual and collective behavior can create an even safer Imerys. The “Serious Seven” safety compliance program governs safety in the critical areas of Lockout/Tagout/Tryout, electrical safety, machine guarding ns conveyor safety, mobile equipment, working at heights, ground control and forklift safety. A new campaign of Imerys in order to improve our safety performance as Group and to eliminate incidents especially fatalities or life changing incidents. From the above-mentioned the commitment to continuous training is obvious. All Imerys employees are informed regarding health and safety issues, with specific and targeted training interventions, informative sessions on relevant corporate standards and customized sessions based on specific risks identified. 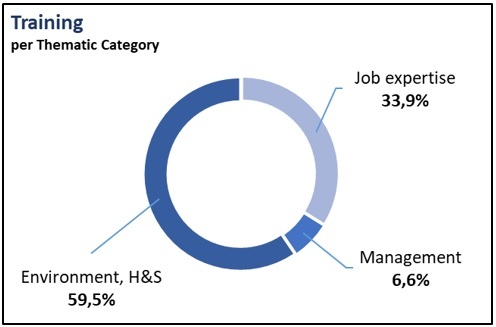 Training of Imerys Greece S.A. employees for 2017 (total number of 311) per thematic category and cost are depicted in the attached charts. Imerys Greece S.A. had a total number of 311 employees for 2017. 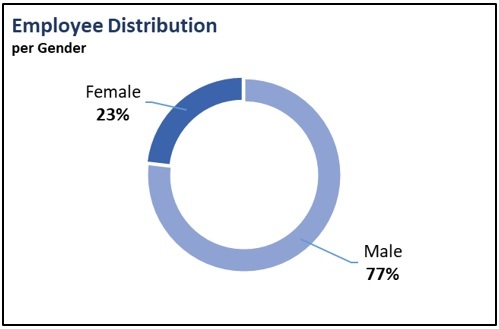 The distribution of employees according to their gender, hierarchical scale, years of employment, age group and facility that they are operating is depicted in the attached charts. Safety and health are core values for all Imerys operations worldwide. Imerys is committed to developing a proactive safety and health culture through partnerships among management, employees, contractors, suppliers, visitors and the communities in which it operates. The Group is likewise committed to continuous improvement cycle of safety and health performance, setting objectives and monitoring, reporting, auditing and reviewing. This safety and health framework is fundamental to the Group's success and contributes to UN GC Principle 1 and SDG 3. Imerys tracks and analyses safety performance on a monthly basis using indicators for fatalities, lost-time accidents, life-changing injuries, and accidents without lost time at the Group level. All levels of the Group review recorded safety performance metrics every month. The progress on all the aforementioned key objectives and programs is reviewed quarterly. Imerys has an internal safety and health incident reporting process and associated database. Incident investigations are conducted and corrective actions are implemented at site level with follow-up at division level. Safety Culture Improvement Team (SCIT) events are organized by senior EHS professionals within the Group to drive safety culture improvement. A Safety Culture Maturity (SCM) matrix integrates all programs built within Imerys Safety System (ISS) and helps operations to conduct gap analyses and drive their improvement plans. The Group Safety Summits focus on strengthening Visible Felt Leadership (VFL) within the most senior leadership. Safety Alerts are issued whenever a lost-time accident occurs to share root causes and lessons learned. Where appropriate, corrective actions identified through an incident investigation are directly integrated into the next update of Group safety protocols to reduce the risk of reoccurrence. In 2017, approximately 59 safety alerts were delivered by the Group. Given the importance of Behavior-Based Safety (BBS) as an essential component within an effective safety culture, Imerys’ operations either implement specialized BBS programs or integrate behavioral factors into regular safety inspections. Improvement in BBS is also supported by a dedicated section of the Group Safety Culture Maturity matrix. “Take 5” is a best practice initiative to drive safety awareness to all employees. This initiative consists of thinking through each task, identifying the risks of the task, evaluating these risks, taking appropriate corrective actions and finally doing the job safely. Training and awareness on Imerys safety and health system are achieved through various communication and training tools that include Safety Summits, Imerys Safety University (ISU), web seminars, a digital learning path called IM-Pulse, which covers Imerys Safety System and key programs amongst other topics, safety toolbox meetings and the Group Welcome Sessions for new managers. The Group recognizes the pivotal role that senior management plays within the Group safety culture. Their ability to effectively engage with all employees at site level on safety is fundamental to continually improve safety performance. The Group Safety Summits focus on strengthening Visible Felt Leadership (VFL) within the most senior leadership, while Imerys Safety University (ISU) focuses on a tailored approach to coach site managers on how to cascade Visible Felt Leadership within their supervisory teams. A new Group safety awareness endeavour was launched in 2017 to focus on the behaviours and actions needed to ensure safe operations. The first Imerys Safety Connect Day focused on safe mobile equipment and pedestrian interactions and earmarked the launch of a powerful film narrated by the Group Chairman and Chief Executive Office entitled “Hidden Dangers”. Imerys Executive and Senior Management demonstrated their engagement by participating in the activities and workshops organized at Group sites around the globe. This event will become an annual event on the Group calendar. Imerys Greece S.A. operations participated in the European Social Dialogue Agreement (SDA) on workers’ health protection through the good handling and use of crystalline silica and products containing it and have reported on specific aspects of their implementation through participation in a program organized by the European Network for Silica (NEPSI)* in the 2016 reporting campaign. To prevent workplace-related illnesses and accidents, Imerys Greece S.A. facilities are certified with BS OHSAS 18001:2007 Occupational Health and Safety Management System (OHSMS). Imerys Diversity Charter outlines the commitment to achieving greater diversity, as well as to equal opportunities and inclusion across the Group is a high priority and shall continue to be the focus of particular efforts at all levels of the organization. Imerys recognizes that diversity is a long-term engagement and while the Group has not yet reached the full target, it is fully committed to accelerate efforts and as such contribute further to SDG 5 to achieve gender equality and empower all women and girls and SDG 10 to reduce inequality within and among countries. For 2017, Imerys Greece S.A., offered "ANASTASIA ANTONIADOU" Scholarship (A.A.S.) institution to women local community participants. A.A.S. is addressed to women graduates of the Milos/ Kimolos senior high schools (Lyceums), who successfully stood the entrance examinations for one of the country’s Universities and it is an initiative interconnected with SDG 4, ensuring inclusive and equitable quality education and promote lifelong learning opportunities for all. Imerys Greece S.A. has also supported ReGeneration program, a project of the Global Shapers Athens Hub, an initiative of the World Economic Forum designed to help combat both youth unemployment and the brain drain phenomenon. Company has applied through the program and during 2017, it has recruited 3 candidates. *NEPSI: The European Network for Silica is comprised of employees and associations of European companies that have signed the multi-sectoral social dialogue agreement. In 2017 there were 0 fatalities or life-changing injuries, 0 Lost Time Accidents (LTA), 3 Non Lost Time Accidents (Non-LTA), 10 first aid accidents, 25 near miss incidents and 143 conditions reported on Imerys incidents’ database for Imerys Greece S.A. In all incidents relevant corrective actions were taken in order for similar incidents to be prevented. 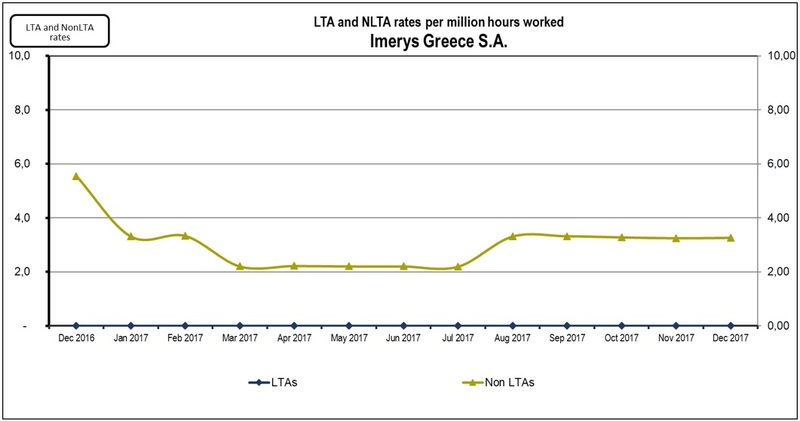 LTA and non-LTA rates per million hours worked for Imerys Greece S.A. in 2017 is depicted in the attached chart. Health surveillance of workers is in compliance with Greek legislation in each facility. In all facilities, workers are given the possibility to obtain external general and specialized medical testing. In Milos facilities, audiometric and spirometry tests are carried out by the occupational physician periodically. There are also performed regularly measurement regarding noise, dust and vibrations from vehicles – equipment to all relating employees. Harmful factors’ measurements are also conducted within the office premises for office employees. Alignment of contractors within Imerys Safety System (ISS) and safety cultural expectations is fundamental to achieve the safety objective set each and every year. As such in 2017 a new Contractor Safety Management initiative was launched, which outlines a common and systematic approach for the selection, monitoring and continuous improvement of the health and safety performance of contractors and sub-contractors. In addition, Imerys Code of Business Conduct and Ethics (“the Code”) summarizes the principles of ethical behavior the Group expects from all of its contractors, suppliers, and other partners, let alone employees. The relevant disclosure is mentioned within Criterion 14. No incident of discrimination took place in 2017 at Imerys Greece S.A. facilities, thus there are not any incidents report and relevant corrective actions. Human capital is at the heart of Imerys business. Imerys is committed to develop the professional and personal capabilities of its employees, provide them with appropriate benefits, promote workplace diversity and maintain industrial relations by fostering an environment of mutual respect. Through constant engagement on these subjects Imerys contributes to various SDG goals, such as SDG 8 to promote sustained, inclusive and sustainable economic growth, full and productive employment and decent work for all and SDG 4 to ensure inclusive and equitable quality education and promote lifelong learning opportunities for all. The Group is committed to continuously diversify and increase Group’s training program through a blended learning approach, enabling employees to actively lead their own development and learning experience. The Group e-learning platform “IM-Pulse” hosts Imerys’ entire training offer. Training courses can be followed on line or in person. Internal communication campaigns aim to provide all employees with information that can help them understand Imerys strategy, environment and activities, build their sense of belonging and highlight the Group’s values to help strengthen its identity. Open communication is shared through a variety of formats, including through Imerys intranet, which hosts information on Group charters, policies, protocols and procedures, latest news, transversal programs, job and mobility offers, new appointments, acquisitions, practical tools, and access to other dedicated sites. To highlight employees, projects, initiatives and successes throughout Imerys a digital newsletter “Headlines” is published regularly and shared with all employees via e-mails. A special edition is systematically dedicated to the winners of the annual SD Challenge competition to provide details and share best practices in CSR. The Group Enterprise Social Network “Chatter” is an additional platform to share information and support discussion on specific topics and within specialized communities. 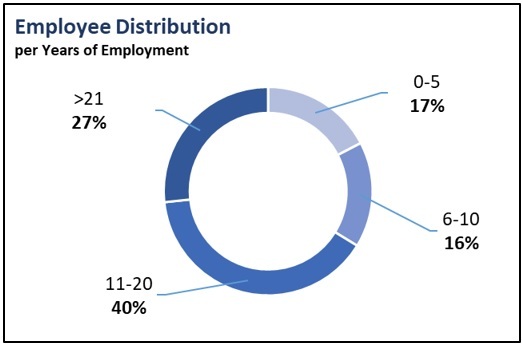 Imerys Greece S.A. employees (Milos and Athens facilities) hiring and turnover is depicted in the following table. Employee turnover refer to employees who leave the organization voluntarily or due to dismissal, retirement, or death in service. Imerys Greece S.A. total educational expenditure for 2017 amounted to 62,111.80€ for job expertise trainings, management trainings and environmental, health and safety trainings, with 9,241.08 total training hours. One of the most material issues, which would also be the 2018 CSR priority themes is fair operating practices and responsible supply chain. Imerys believes that high standards in all environmental, social and governance (ESG) areas are essential for all of its business operations. Imerys expects its business partners and suppliers to adhere to the same principles as elaborated with the Code of Ethic and Business Conduct. In 2016, Imerys defined and launched its supplier ESG standards. The standards are based on the ten principles of the UN GC initiative and are based on the International Bill of Human Rights, the ILO’s Fundamental Conventions, the Rio Declaration on Environment and Development, and the United Nations Convention against Corruption. For additional information, please refer also to criterion 4: Management of value chain. Starting from its suppliers of more than €2 million spent at divisional level, the Group requested formal confirmation of compliance with the standards. 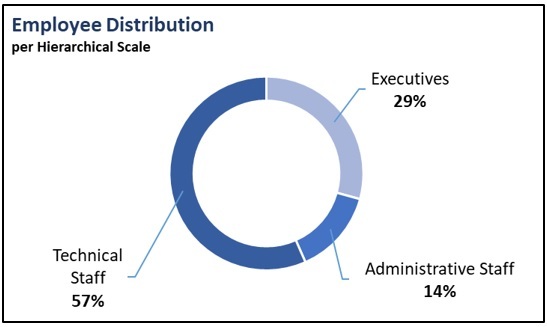 At the end of 2017 these standards have been communicated to over 150 suppliers, of which 70% have formally acknowledged receipt and confirmed compliance with, 25% have provided comparable codes of conduct and the remaining have been assessed internally as presenting very low risk of non-compliance with the Group Code. Imerys considers responsible supply chain a key priority and thus shall continue to progressively evolve the compliance review along its supply chain as a means to contribute to several SDGs. Imerys organize every year a company-wide competition that serves as an impetus to develop and share best practices, innovations, and technological solutions, each contributing to CSR commitments and supporting progress towards several UN Sustainable Development Goals. The internal program is called “SD Challenge” and supports the development and sharing of best practices in stakeholder and local community engagement. Imerys SD Challenge 2017 edition reached a record level of participation with 130 projects submissions representing all the Group geographic areas and divisions. To be considered for the Challenge a project must help to achieve the goals of the Sustainable Development Plan 2015-2017 and focus on long term sustainable results. A special edition of the Group digital newsletter “Headlines” is systematically dedicated to the winners of the annual SD Challenge competition. The European Minerals Day 2017 events “Take Safety Home” of Athens and “All the time I play, minding anyway” of Milos facilities, were the winners of 2017 Sustainable Development Challenge of Imerys in the Minerals Day Activities category. Imerys Greece S.A. transformed a rehabilitated perlite mine in Milos Island to a new financial activity via viticulture. Starting from February 2014, approximately 22,300 vines have been planted in a total area of 63.1 acres. In August 2015 the first quality control vine harvest took place, while in August 2016, the first vine harvest was conducted at Milos’ Vineyard. 300 kilos of grapes were turned into wine and the first bottling of wine production took place in 2017. Bottles of wine were distributed to all Imerys Greece S.A. employees. In Bravo 2017 Sustainability Awards, Imerys Greece S.A. got a distinction in “Bravo Market” category for Miloterranean Geo Experience initiative. Through Vineyard initiative, environment is protected and preserved as organic cultivation method is applied. Moreover, irrigation water is recycled, which is an aspect of invaluable importance as water in the Cyclades Islands is in shortage. Four free training seminars with approximately 300 participants have already been provided to the local community, encouraging Milos’ residents to revive small family vineyards using organic agricultural methods. Education on the use of industrial minerals is also encouraged, as prominent examples of Milos’ minerals are used in viticulture and wine production. These minerals are sulfur, protecting the crop from disease in organic winegrowing, bentonite that is used for wine stabilization and perlite that is used in wine clarification. Finally, the activity will also contribute to “alternative” tourism on the island, attracting visitors interested in wine-making and wine-tasting. Every year around 1,000,000 MT of bentonite are mined on Milos Island and almost all of that quantity has to be dried to about 15% on average. Significant energy saving is achieved by exploiting Milos’ climatic conditions - that is high temperature and wind during summer - for the natural pre-drying of bentonite in open fields. This results in approximately 35% annual energy savings, compared to the energy that would be required if industrial drying was exclusively used. It is estimated that some 100,000 MT of water are evaporated on a yearly basis through this field drying process. This is equivalent to actual savings of about 7,500 MT of annual crude oil consumption, corresponding to CO2 emissions reduction in the range of 24,000 MT per annum. Milos Plant Nursery and Botanical Pathway are both an environment rehabilitation and an educational destination. The nursery is consisted of 864 types of Milos plant species and a botanical pathway is created by cultivating these plants. The creation of Milos plant nursery dates back in 1994. In 2017, 216 pupils of all grades of the Milos and Kimolos islands’ schools visited the Plant Nursery and attended 12 relevant seminars. Miloterranean Geo Experience makes Milos a brand name in tourism. It consists of 8 mapped roots revealing the unique Geology of Milos, each of one consisting a specific guide. The project was launched in 2012 and the 8th path was added in 2017. In Bravo 2017 Sustainability Awards, Imerys Greece S.A. won the first prize in “Bravo Society” category for Miloterranean Geo Experience initiative. Imerys Greece S.A. sites took part in 2017 European’s Minerals Day, held by professional association Industrial Minerals Association – Europe (IMA-Europe). This is an industry-wide initiative - celebration demonstrating the importance of minerals to the public and an opportunity for engagement local and regional stakeholders, which takes place biannually. Milos and Athens activities focused on safety, safe behaviour and self-protection, addressed to children of all ages. 165 participating children in both events, from 5-17 years old, were initiated in the notion of Safety while they are walking, bicycling, playing in their neighborhoods, everywhere and anytime in their lives. Milos EMD event on September 22nd, 2017, was based on Aesop’s fable “The Ant and the Cicada” and aimed at raising children’s awareness on safety issues in a way to urge them to watch out and take care of themselves and those around them, while playing. Children of the 2nd and 3rd Grades of Milos Primary Schools participated in this educational activity focusing on safety at school, at home and at play. Scene of action was Imerys plant nursery at Pollonia, arranged with appropriate care to host the educational program featuring a theater and a musical event. Athens offices’ EMD event on September 23rd, 2017, was based on Imerys Safety Connect Day (SCD) theme “Mobile Equipment and Pedestrian Safety”, but that time with the participation of 60 Imerys employees’ children as well as 40 children from “SOS Children Village” (NGO protecting interests and rights of children). There were 3 parallel Road Safety Educational Programs designed and presented by Traffic Safety experts of Road Safety Institute (R.S.I.) “Panos Mylonas”: Pedestrians Educational Program (5-8 years old children), Bike Educational Program (9-12 years old) & Traffic Educational Program for teenagers (13-17 years old). 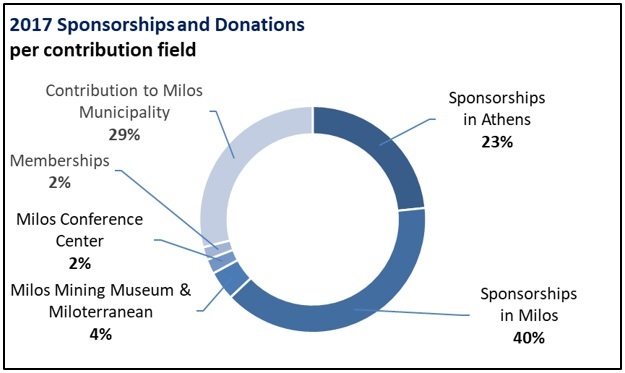 Imerys Greece S.A. direct economic value distributed consists of facilities’ sponsorships and contribution to local society, as depicted in the attached chart. In 2017, Corporate Social Responsibility (CSR) sponsorships totaled 544,288€. This overall amount includes the mandatory municipal financial contribution to Milos, which amounts to 157,632€. “Added” value initiatives such as post-mining use (vineyards) and sustainable tourism (Miloterranean). All employees were provided with one wish star to write their Christmas wishes and decorate company’s Christmas tree. Initiatives of Action Aid, WWF and “The Smile of the Child” NGOs. Total visitors at Milos Mining Museum (MMM) were 7,550. 70% were foreigners, basically Italians and French and the rest 30% were Greeks. Museum ran 21 educational programs, in which 826 local school students participated. 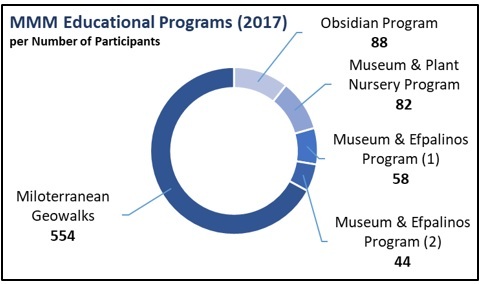 The composition of visitors for 2017 according to their age group and the number of participants in MMM educational programs is depicted in the attached charts. For 2017, annual institutions of the "ANASTASIA ANTONIADOU" Award (A.A.A.) and the "ANASTASIA ANTONIADOU" Scholarship (A.A.S.) were offered to local community participants. A.A.A. is addressed to both Imerys’ local employees and Milos residents in order to encourage actions and initiatives in the fields of social, cultural and voluntary contribution. A.A.S. is addressed to women graduates of the Milos/ Kimolos senior high schools (Lyceums), who successfully stood the entrance examinations for one of the country’s Universities. In 2017 Milos Conference Center (MCC) – George Eliopoulos was used for 49 days in total and held 4 daily workshops with 415 participants and 36 events with 4,682 participants, such as presentations, awards and cultural events. The total number of participants in MCC events was estimated 5,097. Christmas event organized by Imerys Milos facilities for employees’ children and children of Milos residents on 02.12 (300 attendants). Group of 15 employees, who are trained on dealing with marine oil pollution incidents. This group acts in cooperation with public state bodies. Provide students of this special school with handcraft materials, so as to make decorations and ornaments for their annual Christmas bazaar. Students were also provided with clothing. 40 children from “SOS Children Village” participated in the Safety Educational Programs of European Minerals Day (EMD) event on September 23rd, 2017. Imerys Greece S.A. does not receive any financial assistance from government agencies and is not subsidized by the Greek state budget. Imerys Greece S.A. has not donated to any political party during the reference year and did not contributed to them, either financially, or in any other way. Imerys has in place the Anti-fraud and anti-bribery policy which sets out Imerys’ strong commitment to the prevention, deterrence and detection of fraud and corruption. It summarizes the responsibilities of the Board, management and employees, defines the fraud and corruption investigation and reporting processes, and describes related disciplinary actions. Every Imerys employee has a key role to play in preventing and detecting fraud and bribery and must report his or her concerns promptly, using the relevant reporting channels. Internal Audit is responsible for evaluating the internal controls that have been implemented and recommending any steps that may be needed to improve controls and thus mitigate risks. The risk assessments that are conducted by Internal Audit should provide the basis upon which audit plans are devised and against which internal controls are tested. Internal audits can serve simultaneously as a deterrence and detection mechanism. If Internal Audit becomes aware of possible fraud or bribery, a duly authorized representative of Internal Audit should notify the Group General Counsel immediately of the suspicions that have arisen. A fraudster, pretending to be an Imerys employee, sent a fake Imerys email to a customer, advising that a different bank account should be used for future payments. One customer payment was thus deviated to the fraudulent bank account. A controller booked some unjustified adjustments in the magnitude local package of four legal entities in order to increase the 2014 and 2015 consolidated net incomes and thus deliver on the expected figures. An Imerys employee booked a rental car for personal use and had the invoices paid by the entity. An Imerys entity has experienced internal fraud through 4 different schemes perpetrated by an accounts payable (A/P) accountant. An Imerys Manager developed a network of 3 services providers which responsibilities were to install Imerys finished goods on customers’ sites upon Imerys request, as part of specific projects. Yet the employee’s direct relative was a significant shareholder of one of those providers. This conflict of interest was kept undisclosed by the employee who arranges favoritism towards this service provider, while trying to show a fair balance of business awards amongst the 3 providers. A fraudster hacked the email box of an Imerys employee (via a spear-phishing attack) and diverted the payment of an Imerys invoice after having instructed the customer by email that a different bank account should be used. In every fraud alert, details are given for how the fraud is facilitated and the corrective action proposed in order not similar incidents to take place. There is also a constant reminder that reporting and communication are keys towards avoiding fraud acts. During 2017, no fraud or corruption issues have been detected in Imerys Greece S.A..